Truss design - are these ones OK? I need some advice from people who have experience building large structures. I'm looking at building a GBC module that takes balls across a gap between two tables, that's high enough to walk under. I need a vertical lift of about 1.3m, and a horizontal travel of about 1m. Now, this would be by far the largest model I've ever undertaken, so my intention is to design the thing in LDraw before I buy anything. This means I can't see how sturdy the structure actually is, so I'm asking you all whether what I've designed so far is sensible. I've got two slightly different truss designs. One that I think would go better for the vertical parts, and one for the horizontal. Each is a single unit 16 studs in length, with the idea that you join as many units together as you need to get the length/height required. 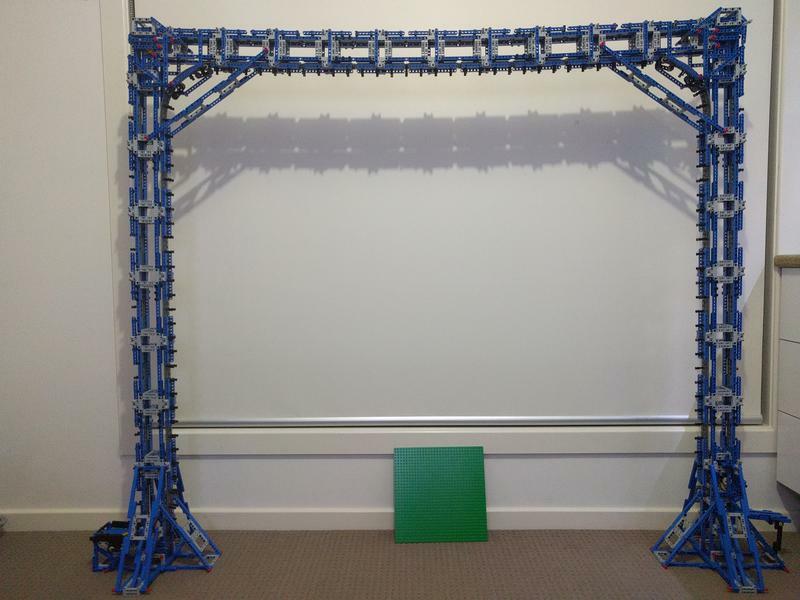 I feel that this truss is going to be strong in compression/tension, but all that space in the middle makes me nervous - is the 5x7 frame box going to be solid enough to make it strong in torsion as well? This one I think would be quite resistant to bending in the up/down direction (exactly what you want for a horizontal beam supported at its ends), less so in the side/side direction, but also strong in compression/tension. This one would be somewhat heavier than the other - overkill? or is the extra strength warranted? I'd appreciate your thoughts on these two truss designs. If you want to see the .ldr file that these images came from, it's here. P.S. If anybody wants to take these and make them into a tower crane for [TC8], go right ahead. EDIT: Yes, I know there are no triangles. I am relying on the rigidity provided by the 5x7 frames in place of diagonal bracing. Your truss designs look pretty good, I only have one comment. Usually trusses have some kind of "X" design, the reason is so the the square area is broken up into 4 triangles with the "X". As a student in an engineering college that I the first thing that I saw. It truly know if they are good or not you would have to do some load tests and see if the design can hold up to the weight, and if it can't, throw some "X"s in there. Aminnich is right, the triangle is used in all (or most?) trusses. It adds a lot of strength to the structure. By the way, the 3L double-ended pin part (red in your pictures) has a hole between the pins. In my experience adding a friction pin in that hole eliminates quite a bit of slack between the parts. They look rather weak to me. There is no continuous long beam without gaps. It's some kind of a zigzag pattern, which, I would imagine, would add a lot of play to the structure. Use triangles. Triangles are always rigid. Doesn't matter if you use the X or not, but if you have a rectangle, add a diagonal. Another approach is to go studded. Studded bricks are much more rigid if used in tandem with plates. Just check the main boom of 8421. If you just do plate-brick-plate-plate-brick-plate, and connect the bricks with some 3L beams vertically, and you have a very strong beam that can extend over 100 studs. I had hoped that the rigidity provided by the 5x7 frames would reduce the need for diagonal bracing. That's going to be tough, because there's no corresponding hole in the 5x7 frame to put the other side of the pin! Oh, and one design constraint I forgot to mention: I anticipate most of the parts coming from next year's LUGBULK program, so I want to minimise the variety of parts used. As one of my structures professors used to say (and make dozens of powerpoint slides that said..) "Triangles are Magic"
While in real life triangles are indeed the way to for low weight, high rigidity structures, that doesn't automatically means that this holds true for Lego as well. The 5x7 frames are really good at providing a rigid mounting point in which moments can be absorbed, so they are not a bad choice as a basis for your structure. There is one disadvantage though, you are limited to the 5 stud height. Depending on the lengths you want to span (and the loads you want to bear) this might become a too restricting limit (adding multiple 5x7 frames above each other might be a solution, but you will have to be very careful in designing it such that the rigidity of the frames do not get lost in the flexibility of all the interconnections needed). For the horizontal part the largest stress will be in the top and bottom 'fibers' of your truss. For that reason it is of paramount importance that you have long, continuous beams at both top and bottom. Like you do on the vertical member (if you would put it on its side). For those beams it is also important that the holes are oriented sideways. Beams with holes pointing upwards will not provide a lot of loadbearing capacity (they rely on friction to be kept in place and the outer most fiber is basically a thin sheet with 90% holes. The fibers should be as far apart as possible (you could argue that you'd like the 5x7 frames in the seven stud high orientation because of that, but than mounting the 15L beam becomes a bit more difficult and ineffecient). 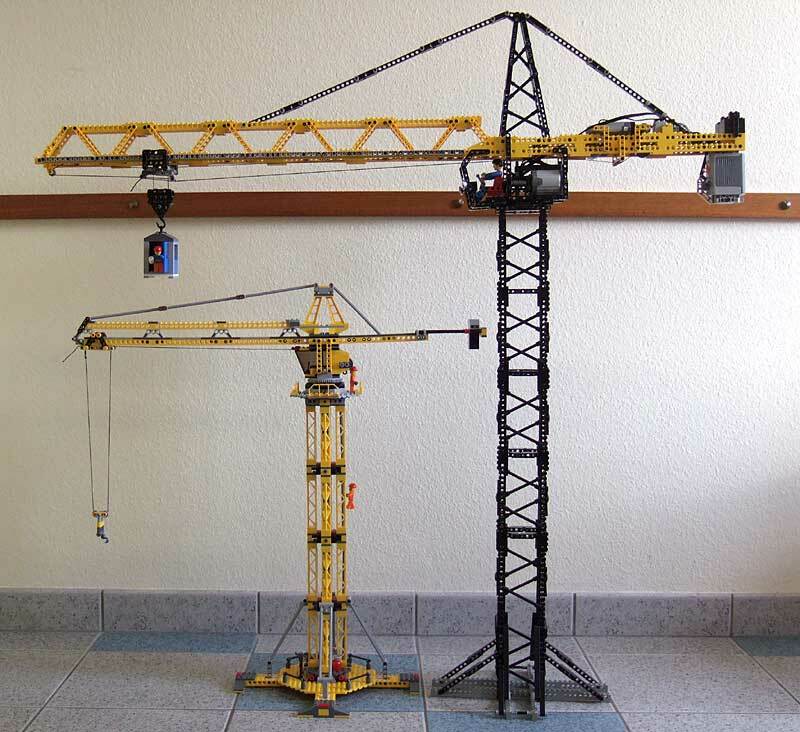 For the vertical parts the loads are different: Some vertical load which can be easily absorbed by almost any Lego structure and only when thin enough buckling might become an issue. Torsion would not be my biggest worry, unless you foresee an application where a lot of torsion is introduced in the structure. So I think the vertical member is actually quite good to act as a horizontal member as well, but connect the 15L beams directly to the 5x7 frames. I would avoid any pins pointing vertically. I strongly discourage the use of the red elements (3L beam with 4 pins and 3 holes thingy). Since the pins are frictionless they have so much play in them that you basically loose all the rigidity of that wonderful 5x7 frame. Either use two 1 hole-2 pins-thingies, or just use normal friction pins. Final point of attention is the sideway loads. These high, thin and relatively light structures that you can build with this system are probably sensitive to people accidently brushing against it. Think of it as a structure made of straws connected only at the tips (with the straws mimicking your trusses). Unless you use triangles to connect those straws it is very difficult to get a rigid structure. But these are triangles of trusses, not so much triangles in the trusses. Thanks Jeroen - that's exactly the kind of reply I was looking for. With that in mind, I had another go. I've got one truss module that I'm hoping would go OK either vertically or horizontally. 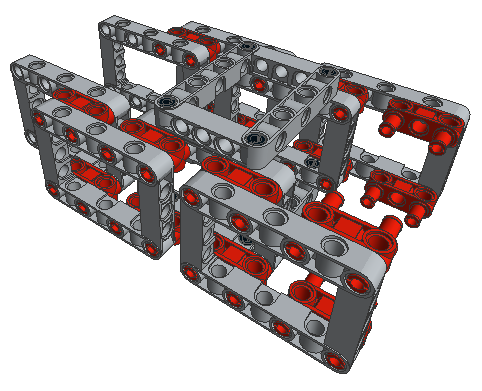 There are now 5 studs between rails rather than 3, but only two pins connecting each rail to the frame boxes rather than 4. I wonder if that's a good compromise. The interior is only 5x3 now, instead of 5x5, but I can live with that. The only torsion I was worried about was indeed in the case of someone bumping the tower, which might cause the other tower to twist given the big long lever between them. I am certainly planning to brace the joins between the horizontal/vertical segments. I went with the red parts because I figured that one 3-long connector would be stronger than 2 1-long connectors with a space between them. They also make for an easy way to attach beams with the holes in the other direction. But I concede your point about looseness. If you keep the structure as is you can use 3L pins to connect a frame to two 15L beams. Adding 3 pins to connect two beams does not add much in terms of stiffness (but doesn't hurt either). I remember seeing a post once about the effect of having longer overlaps between beams. The conclusion was that a minimum of one open stud between two pins was needed to get a good connection, but that making the overlap bigger didn't really add much more rigidity (law of diminishing returns). One thing to consider is to place the 15L beam that connects the two modules on the inside. It will make the distance between the module bigger (by 4 studs). You will still have a 5 stud overlap between the 15L beams which should give more than enough rigidity. Furthermore the beams don't stick out two studs which makes it better to withstand a vertical force on the edge of the beam (less moment). Finally the gap between two longitudal 15L beams is than 5 studs, so if needed you can add another 5x7 frame inbetween if needed. In official lego models you often see bracing that mechanically locks everything in place. I'm not sure it is needed on this structure, but you could make it with some perpendicular connectors on the outside of the longitudal beams and beams going over the top and bottom of the 4 5x7 frames block. If you use an axle to make the final connection you can make it such that the only way to bend the truss sideways is by breaking the parts. The way it is now the beams will slide of the pins. It will make the frame blocks bulkier though. So it has advantages and disadvantages, it will make the structure even stiffer, but if it goes wrong (the whole structure falls over) it may result in broken parts. Some good suggestions here, I'll play around and see what I can do. I did try putting the beams on the inside of the frame, but I did it with both beams together. I like the idea of only having one beam inside and having only a 5-stud overlap - it gets me more truss for my dollar. I read a report the other day (http://www.eurobrick...showtopic=58343) that found that adding a third (and fourth, and fifth) pin to a connection did add significantly to the strength of that connection. Though extending the overlap didn't help overmuch. I think I'd better allow for the fact that the entire structure might get pulled over, in which case I'd much rather have the parts separate than break. I toyed around with MLCAD a bit and here's what I came up with. Let me explain what I have done. 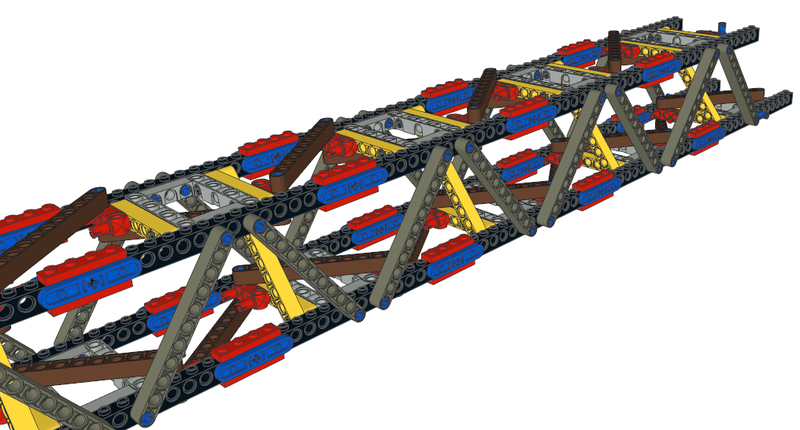 First I used studded beams for the main beams because you can use them head-to-head and connect them with both the studs (red plates) and the holes (blue rotors), and thus create something that acts like a continuous beam over the whole length. Four of those continuous beams can then form the base of the structure. Then I used Pythagoras's 6/8/10 triangle to add diagonals in the form of the dark-gray 11L liftarms. This is basically as rigid as it gets in the vertical direction. Then I used 5x7 beams to connect two of those structures with blue 3L pins. I think you could stop there and have a great structure. I decided to add diagonals to the horizontal sections too (in brown), to make sure these are rigid as well. I think you could leave (and the red connectors) these out. I also added the body diagonals (in yellow) to keep the cross-section square (although you sacrifice inner space with this. Maybe if you replace the yellow diagonals by 5x9 beams you can do the same thing and keep the inner space free for your elevator). Wow, Eric, that's quite the truss! The only thing that could possibly strengthen it further would be some 9L beams connecting the black bricks to each other transversely (over the studs). At the moment, you've only got pins holding the sides on. Nonetheless, this is perhaps too complex for my needs - I can't imagine my structure needing to support more than twice its own weight in conveyor belt and other bits. I appreciate the thought though, and the effort you've put in. I didn't know that about the extra pins giving so much reinforment, thanks for that. I really like the cleanliness of your design now (I hadn't thought of placing the 15L beams on the inside of the frames, but this makes for a very pleasing continuous edge). If you make the 15L beams grey as well it will look stunning I think. Yeah, it looks nice, doesn't it! Thanks for your help. If I decide I want a 2L thick continuous edge, I can always add a couple more frames in the gaps, but I don't think that'll add enough strength for the extra weight and cost to be worth it. I haven't decided what the final colour scheme will be. I made them yellow only really to differentiate them from the red connectors and grey frames. 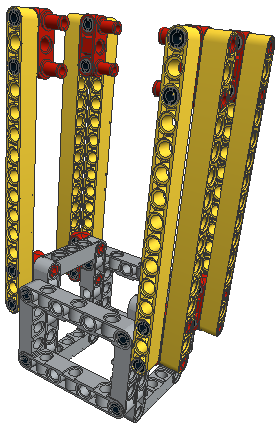 A good way to connect 15L beams is to use the LEGO Beam I Frame (3 x 5L) ( p/n. 14720) with two pins in one 15L beam and 1 pin in the other as long as you cross brace the structure well . 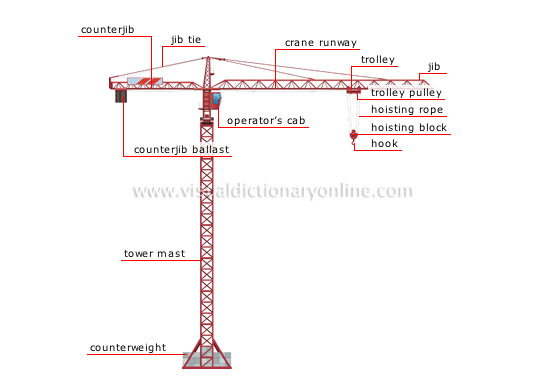 I have used this for my tower crane for the jib construction. Just a thought as well..... and I am sure that perhaps the OP and others are aware of this.... but just in case, here is an alternative, third-party solution. There are companies out there that focus on building with Lego or Lego compatible pieces that are designed specifically for high-strength applications. Although the pieces are expensive I don't think that it would be that much more expensive then all the all the liftarms and frame boxes that you will be using. Those can add up in cost as well. Of course these are not Lego...... but depending on your preferences these can also be a solution. I have used them in the past with great results. Also, the owner of the said store has built some pretty amazing contraptions, almost entirely out of Lego.... only with the added strength of his/her parts from their store. For example a life-sized, powered wheelchair (only with PF motors and battery boxes!!) that carries a full-sized adult. p.s. - I have no affiliation with the above business. I gain nothing from suggesting the store. I am only a previous customer.... and I have found the elements found at this shop helpful when I have built models that need high strength requirements. Also..... obviously this is not a solution if you want everything to be entirely Lego. But it is, IMO, still good information to put out here for others. Well, this will be a lot better than that dodgy bridge we made this year! Although the pieces are expensive I don't think that it would be that much more expensive then all the all the liftarms and frame boxes that you will be using. Those can add up in cost as well. Don't forget GBC balls are a light load. There is no need to over engineer it with metal and what not, unless money is no object. We had this vertical lift for our display. It doesn't have a lot of bracing but it held up. It went up high enough for the 6'4" builder to walk under it. I am going to put the whole design up, one section at a time as I get there, in a thread on the greatballcontraption.com forum, here http://greatballcontraption.com/wiki/Special:WikiForum/Table-spanning_module if anyone is interested in following my progress. And, after a long wait for parts and numerous prototypes of varying size, it's pretty much done. That's a 32x32 baseplate, for scale. The structure measures 170cm across the bottom and 136cm in height, with a gap of 109cm between the base supports. At the top, the horizontal truss spans 130cm, and has 124cm clearance from the ground. It sags approximately 8mm in the middle, which increases to about 10mm in the absence of the diagonal braces. It contains over 500 15- and 11-long beams (plus about 50 other beams of various lengths and shapes), and more than 2100 pins. It weighs a bit less than 4.4kg. The belt, all 737cm of it, takes a little more force to move than I would like, but the clutch gear in the drivetrain provides sufficient torque. I am hopeful that the smaller-scale (full width, half height) run that I have for it in a couple of weeks will allow me to find improvements. Wow! That thing is HUGE! It sags approximately 8mm in the middle, which increases to about 10mm in the absence of the diagonal braces. To prevent sag add a King post or Queen posts above the horizontal beam.